SPRINGFIELD TWP. — On what was Springfield’s homecoming night, you could find a bonfire outside the stadium pregame. During the game, Cheltenham came into Spartan Stadium and left the alumni’s chances of leaving happy up in smoke, as the Panthers went home with a convincing 26-7 win in Suburban One League American Conference play. “We said we just wanted to grind the football and we had some success grinding the football,” said Cheltenham head coach Joe Gro. The Panthers (3-4, 2-2 SOL American) were able to play solid football on both sides, starting with 326 total yards of offense. Cheltenham ran the ball 39 times for 228 yards in the game. Defensively, Gro’s team held Springfield (2-4, 1-3) to just 123 yards of offense. The Panthers also forced some of the mistakes the offense didn’t make — in the fourth quarter Dylan Jones and Brandon Gregory both came up with interceptions. “I just think that we’ve got to get better at executing our scheme,” Springfield head coach Chris Shelly said. “We’re not making the key plays, here and there, we just don’t execute in key spots…On a 4th and 3 we just missed by an inch. That’s the microcosm of the game for us. Cheltenham started out strong on the opening drive of the game, going 77 yards in 10 plays. After a 3-yard run by Yasin Abdul-Haqq on 4th and 2, the drive was capped off by a 34-yard touchdown pass from Branden Mack to Matt Tuszl. A missed extra point had the Panthers ahead 6-0 six minutes into the game. Tuszl finished with three catches for 60 yards. Springfield’s response – and lone score of the night – was set up thanks to the defense, when Nigel Fox recovered a fumble to set up the Spartans at the Cheltenham 14 yard line. Four plays later quarterback Justin Hill scored on a 2-yard keeper. George Baughan made his extra point to give Springfield a 7-6 lead. Hill finished the game with 79 total yards for the Spartans. The final score of the opening 24 minutes came on the ensuing drive for Cheltenham, which started at Springfield’s 49. The big play of the drive again came from Mack, who found Haqq for 17 yards on 3rd and 11. The 6’5” quarterback then scored on a keeper of his own, this one from 12 yards out. A successful two-point conversion sent the teams into the locker room with the Panthers leading 14-7. Mack accounted for 184 yards of total offense on the night, with 98 through the air and 89 on the ground. Cheltenham outgained Springfield 174-52 in the first half. After forcing that three-and-out, Maqq took a handoff around the left end and scampered down the sideline for a 43-yard touchdown that essentially put the game out of reach early in the third quarter. Maqq finished off the scoring in the fourth quarter with a 6-yard touchdown run. The freshman running back finished with 70 yards on 16 carries and those two touchdowns. 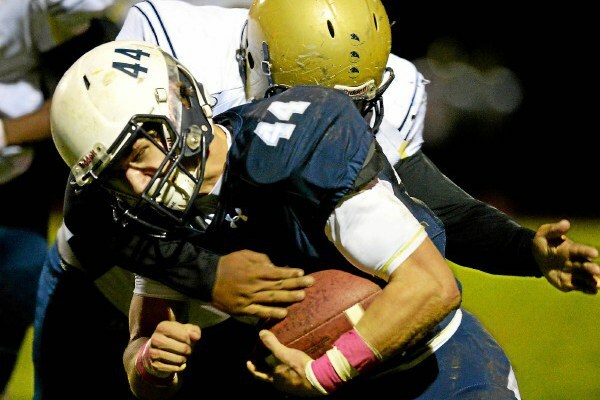 Cheltenham will host Wissahickon next Friday night, while Springfield travels to Upper Merion.